A very nice return today to Pendrell Hall today for Danielles wedding. Today’s wedding was at the fabulous Drayton manor Park. I’m lucky so many venues recommend me and Drayton manor is one of them. AS well as being well known as a theme park, it’s a very impressive wedding venue too! Today’s wedding was that if Kat and Ben. 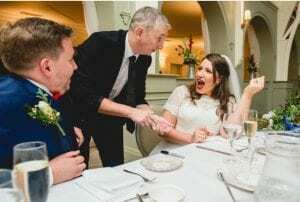 Hampton Manor Wedding Magic with Warwickshire Magician Owen Strickland.A lovely setting today for Trish and Phil’s Wedding at Hampton Manor. My first wedding at this fabulous venue. Hampton has a lovely atmosphere and stunning grounds. It also frequently has long tables as opposed to round traditional tables. 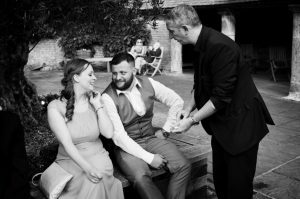 Shustoke Barn Farm Magic – Warwickshire Wedding Magician Owen Strickland. Today was actually my first wedding at Shustoke Farm Barns in Warwickshire. I was booked for Cassie and Ricks Special Day. They booked me for the lull between the wedding breakfast and evening reception. This is a popular booking at venues such as Shustoke, as there is no accommodation. 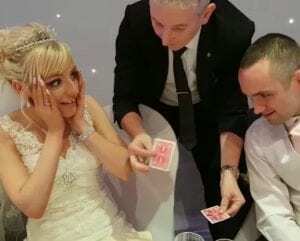 Therefore a magician can entertain guests as they kill time between the two. I’ve said before how important a good photographer is for Your Wedding Day. I only ever recommend the absolute best suppliers, and Lisa Carpenter is definitely one of those! 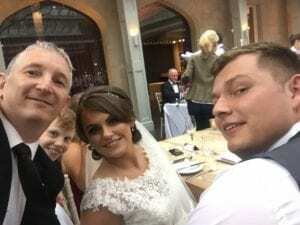 This is one of a number of amazing photos that she has kindly sent me from Jo and Rich’s amazing day at the beautiful Botanical Gardens in Birmingham. It really captures the moment of one of the special tricks i do for the Bride and Groom! Check her website out at www.lisacarpenterphotos.com to see more of her great work!! 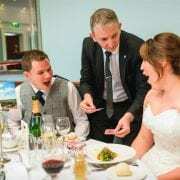 Aston Marina Wedding Magician Owen Strickland-A guest took this great photo as I was performing at Mark and Claire’s Wedding at Aston Marina recently. It captures Claires reaction perfectly.